This glorious piece of work is an Apple corporate video from 1984 that was apparently used during the original Macintosh launch to get the sales team stoked. Three decades later, the video is still working its magic. From the production, to styles, to the Apple hardware, retro  Apple logo, to the amazingly eighties soundtrack of a super cheesy “We are Apple, Leading the Way” theme song, you absolutely can’t miss this. Be sure you turn your speakers sound on and way up for this one, it’s hysterical and so very 80’s. “I remember the video well. I was an Apple sales manager then. The video was produced by/for Apple for internal use – for field sales team use as a motivator. All of us loved it. We had cassette tapes to play in our cars (I think mine is stored away somewhere); Irene Cara did the voice, which I was told was OK with the Flashdance people as long as it was just used inside Apple. 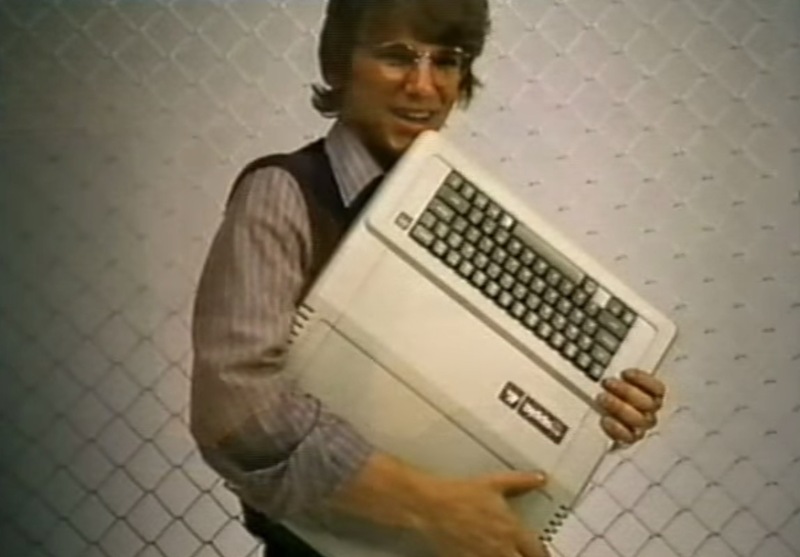 This is basically retro Apple at it’s most ridiculous, offering video proof that even Apple, in all their everlasting infinite coolness, was certainly not immune to the decade of glory known as the 1980’s. No, that’s not Steve, that is me. I miss the 80’s, but not those computers. Holy cow. What a rip off of the song ‘Flashdance’! Flashdance was written 1983 – I am sure they bought the rights. It was a big movie sound track. I worked with Irene Cara in those days and she was extremely litigious. If they would have ripped her off, she would have sued them. WHAT A FEELING! Take your passion and make it happen! Is this Irene Cara from Flashdance? A year after her hit song she makes a song for Apple corporate? Is that Charlie Sheen in there too? What a great tune, I am starting a dance party at the office, TGIF. In fact, I’m going to extract this MP3 and download it to all the Macs at the local Apple Store, this is going to be a big hit. I wonder if this is really made by apple or it was made by a fan, as the many videos you see now in youtube. not hilarious, tragic. Dear Lord, please enable me to kick someone in the face over standard TCP/IP. amen. I’m a maniac! Maniac! On the floor! I’m not sure why there are so many negative reactions to this. I thought it was great. I guess that shows I have no taste. I agree with meleco: This looks more like an amateur production than something official — even from the ’80s. Or perhaps something quickly done on spec by a potential ad agency or something. The images all look like they’re third-party stock art photos shot by photographers and models who had no idea how to use the computers. 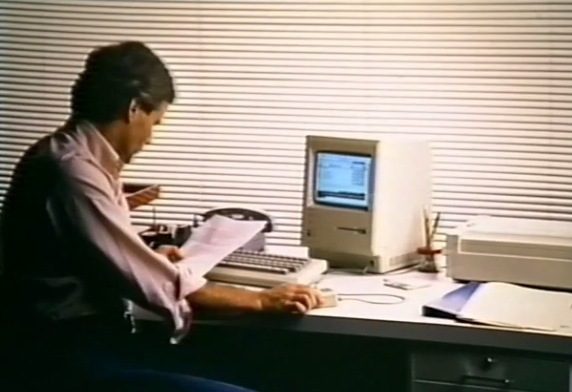 I mean, the shot of the guy looking into his Mac with *both* hands on the mouse, the keyboard shoved off to the side, and the floppy disk halfway in upside down *and* backwards? Come on. No way Apple would have used that in a real ad or video. I’ll bet the Steve had nothing to do with this — pure corporate feel-goodery BS. Anyway, they were nudging Steve out the door around this time (so the big boys could run the company right [into the ground]), right? I remember the video well. I was an Apple sales manager then. The video was produced by/for Apple for internal use – for field sales team use as a motivator. All of us loved it. We had cassette tapes to play in our cars (I think mine is stored away somewhere); irene Cara did the voice, which I was told was OK with the Flashdance people as long as it was just used inside Apple. Sure it’s very dated, but the Apple field team, which grew revenue from a billion to ten billion in the ’80s, helped create the customer base that Steve has built upon in the last fifteen years. I just read the feedbacks from the others… what the heck, this is a genuine Apple deal? Well, well, how things change. I guess 30 years from now people will probably snicker at today’s hip hop hits too. Hey, say what you want to say. It is campy and too long. More thankful that Apple had the vision back then, because without it I wouldn’t be looking at this gorgeous 27″ iMac screen right now. Oh, this is quite real. Apple hired Irene Cara to sing this version. And I know who put this video up on YouTube, and I gave held the VHS cassette it was on in my hand. The video is just plain boooooring and the song doesn’t match the mood of the pictures.